KAPUTT, an installation by Italian-born sculptor, painter, and installation artist, Maurizio Cattelan is currently on display at the Fondation Beyeler until October 6th. Known for his humor and morbid imagery, especially in his use of taxidermied animals, Cattelan has been described as “as one of the great post-Duchampian artists, and a smartass, too” by Jonathan P. Binstock, curator of contemporary art at the Corcoran Gallery of Art. This installation draws upon many of the themes found in the artist’s previous work, and viewers may be reminded of the numerous tongue in cheek sculptures Cattelan has already exhibited at the Vienna Secession; Museum für Moderne Kunst, Frankfurt; Kunsthalle Basel; MoMA and MoMA PS 1, New York; Museum Fridericianum, Kassel; The Tate Gallery, London; and Moderna Museet, Stockholm. 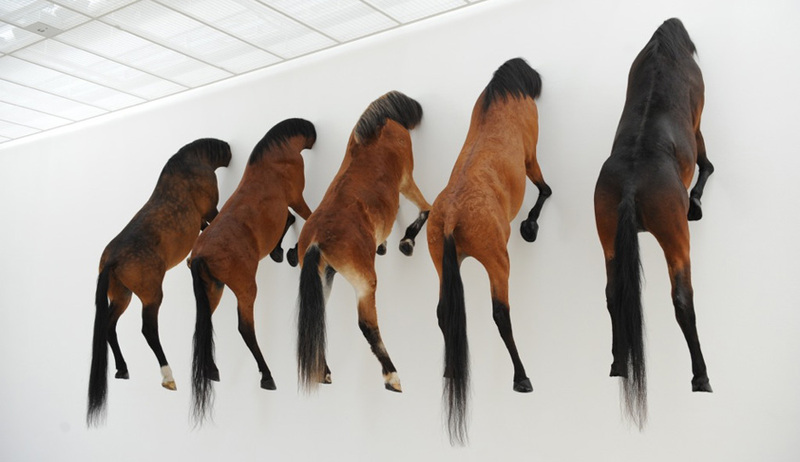 The installation features five horses mounted to the top of a white gallery wall, their heads “buried” beneath the drywall, and their tails hanging limply between their legs. The horses’ hides vary in shades of brown, but they otherwise appear virtually identical, their forehooves pointing towards their bodies as if each animal were frozen mid-leap, cut off by the architectural structure of the gallery. The work calls to mind a similar re-exploration of an older, untitled work by the artist from 2007 that also featured a single horse’s body hanging with its head through a wall. Where the previous iteration had conjured a sense of loneliness or isolation, this new version with five headless horses galloping through the wall plays with a kind of herd mentality, while still remaining open to interpretation in its own context. Cattelan makes use of yet another horse in Kaputt–this time choosing to lay the dead animal on its side, almost as if it were a child’s toy knocked over. Planted firmly in the horses haunch is a wooden sign reading, “INRI,” an acronym for the famous biblical phrase “Iesus Nazarenus Rex Iudaeorum” which translates from Latin as “Jesus of Nazareth, King of the Jews.” This oblique allusion may call to mind various scenes from Christ’s crucifixion, during which the phrase is repeated by soldiers, and affixed to the cross by Pontius Pilate. Whether this taxidermied horse is a stand-in for Cattelan, Christ, or both is left up to the viewer to decide, but given Cattelan’s recent decision to retire from the art world, some viewers and critics may find themselves hoping for a resurrection. Kaput is currently on display at Fondation Beyeler through October 6, 2013. 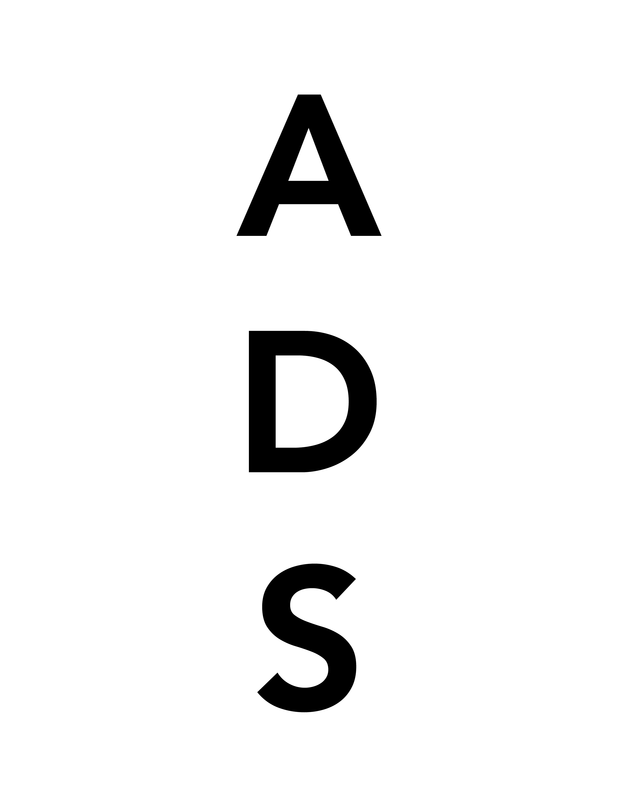 This entry was posted on Sunday, September 15th, 2013 at 12:00 am	and is filed under Art News. You can follow any responses to this entry through the RSS 2.0 feed. You can leave a response, or trackback from your own site.